Make sure your child wears the proper protective gear during sports and recreation. For example, use a properly fitted helmet while bike riding, life vests when swimming or boating, and wrist, knee and elbow protection, in addition to a helmet, when skating or skateboarding. Supervision is key to keeping young children safe in all aspects of their lives. 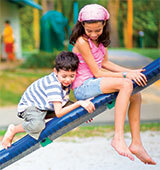 On the playground, make children play on age-appropriate equipment. Ensure that the ground under the equipment can absorb shock—wood chips and shredded rubber are best. It is estimated that car seats are installed improperly 85 percent of the time. Have your car seat installation checked by a pro. Children under 80 pounds or 8 years old must be in a booster seat for proper placement of the seat belt straps. Baby seats must be rear-facing and placed on the back seat. Never leave a child alone in a car, especially on warm days when the heat inside the car can rise to lethal temperatures. Scalds account for 40 percent of the burn injuries seen in children up to age 14. Most are second-degree burns caused by boiling-hot liquids in the kitchen. Place pots on back burners with the handles turned inward, out of the reach of children’s hands. Misjudging the heat of bath water is another reason for scalds. Never place a child in bath water before checking its temperature. Always strap children into car seats, strollers and shopping cart seats. Keep stairs free from clutter and safe with solid hand rails. Use night lights in children’s bedrooms, halls and bathroom to prevent falls at night. Keep young children away from heights, such as decks, porches and balconies. A screen will not keep a child from falling out a window. Even a fall from a first floor window can be deadly, so make sure windows are locked or install child-safety window guards. Don’t place furniture near open windows, since small children can climb up a chair or table and tumble out. Drowning is called a quiet killer. A child will not yell or start flailing—he’ll just sink under the water. Small children can drown in an inch of water, so proper supervision is a must. 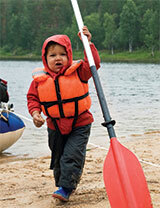 Children should wear life vests when around pools and beaches, and learn to swim as soon as possible. Parents should know CPR. Keep backyard fences around swimming pools and hot tub lids locked. Poisoning is among the leading causes of childhood injury, according to the Centers for Disease Control. Every day, more than 300 children in the United States (babies to age 19) are treated in emergency departments, and two children die, as a result of being poisoned. Everyday items in your home, from household cleaners to plants, cosmetics and medicines, can be poisonous to children. Active, curious children will often investigate—and sometimes try to eat or drink—anything that they can get into. Here are some tips to help poison-proof your home. Use containers with child-resistant tops. Be aware that by the age of three, many children are able to open child-resistant tops, even if it takes them a little longer. Keep all dangerous chemicals in original containers. For example, do not store weed killer in an old drink bottle as a young child may mistake it for something safe to drink. Discourage your children from eating any plants or fungi when outside. Some can be extremely poisonous and even fatal. Avoid buying plants with poisonous leaves or berries. Safely dispose of unused, unneeded or expired prescription drugs and over-the-counter drugs, vitamins and supplements. To dispose of medicines, mix them with coffee grounds or kitty litter and throw them away. You can also turn them in at a local take-back program or during National Drug Take-Back events. The nationwide poison control center number is (800) 222-1222. They are available 24 hours a day, seven days a week. Call 9-1-1 if you have a poison emergency and your child has collapsed or is not breathing.